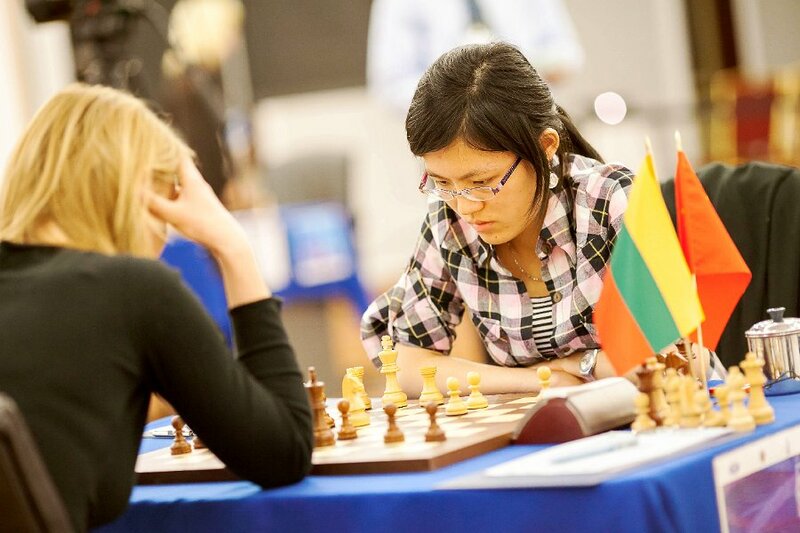 The Kazan Chess Grand Prix for women has just two more rounds to be played. India's Koneru Humpy is in joint lead after nine rounds along with Armenia's Elina Danielian and Slovenia's Anna Muzychuk. In Round 9, Humpy beat Kateryna Lahno to go into the lead. Humpy has the best tiebreak score among all the three leaders and she could very well win the tournament as well. 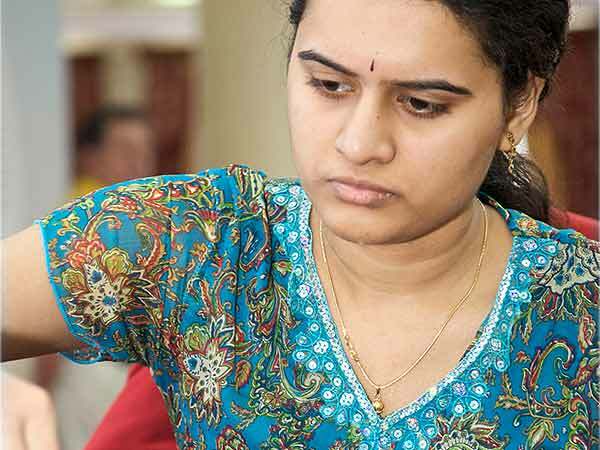 Kazan Chess Grand Prix Round 9 saw a super game by India's Koneru Humpy to beat Kateryna Lahno and go into joint lead on Wednesday. The other very attacking game of the day was played by 12th women's world chess champion Alexandra Kosteniuk to bring down leader Elina Danielian. This is Danielian's first loss of the tournament. Kosteniuk played for the initiative right from the start and found a nice sacrifice to open central files. Danielian's defeat allowed Anna Muzychuk, who drew with Viktorija Chmilyte, and Koneru Humpy, who beat Lahno, to take joint lead with Danielian. Kazan, in the Republic of Tatarstan, is hosting the FIDE Women's Chess Grand Prix, part of a series of elite events organised by FIDE and Global Chess. This tournament is running from June 9 to 23, 2012. The entire Grand Prix series includes six tournaments over two years in various countries around the world. The winner of each tournament takes home 6,500 euros. The total prize fund is 40,000 euros. The overall winner will get a further 15,000 euros at the end of the series. Don't forget to watch the last two rounds of the Kazan Chess Grand Prix live at the official tournament website from India time 4.30 pm. Armenia's Elina Danielian is apparently set to win the FIDE Women's Chess Grand Prix currently on in Kazan. Four games were decisive in the eighth round on Monday. In the two chess games that were drawn, Betul Yildiz and Viktorija Cmilyte missed wins against sisters Nadezhda and Tatiana Kosintseva. Armenia's Elina Danielian - Set to win Kazan? Elina Danielian scored a cool win over second in the standings - Kateryna Lahno. Anna Muzychuk managed to get a good position against Alisa Galliamova and managed to win in the endgame even though Galliamova had equalized in the middlegame. Alexandra Kosteniuk lost to Hou Yifan. Humpy Koneru played very well to defeat Antoaneta Stefanova. India's Koneru Humpy (right) on her way to beating former women's world chess champion and current women's world rapid chess champion. 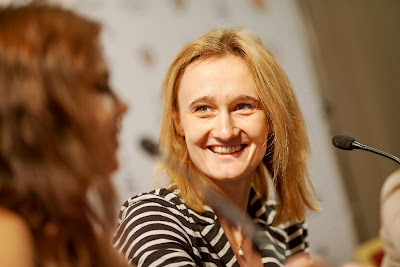 After eight rounds at the Kazan Chess Grand Prix, Elina Danielian leads with 6 points. Anna Muzychuk is in second place with 5.5 points. Viktorija Cmilyte and Humpy Koneru share the third spot with 5 points. Hou Yifan and Kateryna Lahno are in shared fifth place with 4.5 points. Photos by Rashit Shiriyazdanov and Anastasiya Karlovich with kind permission of FIDE from the official website. 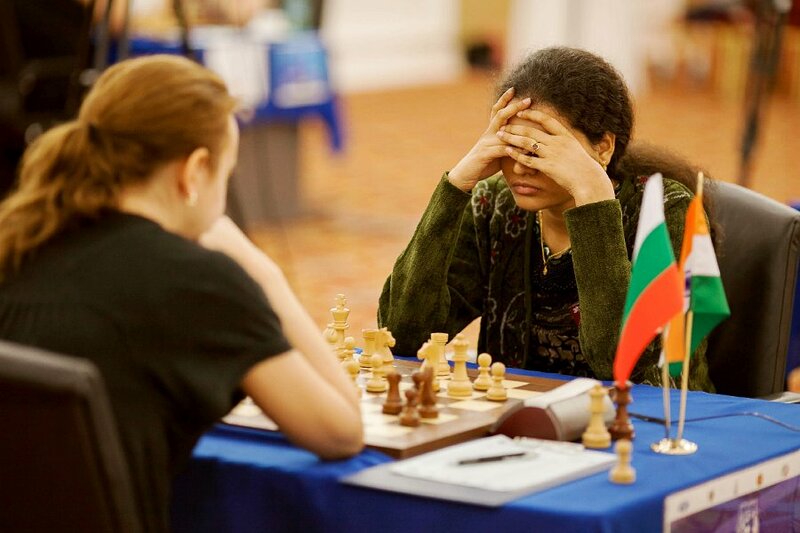 You can watch the Kazan Women's Chess Grand Prix live at the official website from India time 4.30 pm. Tuesday is a rest day with three more rounds to be played at the Kazan Chess Grand Prix. Armenia's Elina Danielian has got a strong hold over the Kazan Women's Chess Grand Prix by the end of Round 7. Danielian drew with former women's world chess champion to maintain her lead. Her depth of understanding an endgame defence in a complicated situation against a former world chess champion was evident. Armenia's Elina Danielian is on a roll at the Women's Chess Grand Prix Series 2011-2012 in Kazan. Scoring back to back victories, she maintains her sole lead after six rounds. Anna Muzychuk, who had caught up with Danielian in joint lead, could only score a draw in the sixth round against a very determined former women's world chess champion Alexandra Kosteniuk. The tense game could only end in a draw. Meanwhile, Katerina Lahno playing with Black tried her best to gain advantage of Alisa Galliamova's badly placed Knight and scored the win with the latter coming under time pressure. Tatiana Kosintseva scored the first win for herself by beating Betul Yildiz. Yildiz's only win in the tournament has actually come against top seed women's world chess champion Hou Yifan. The Turkish player underestimated Black’s Queenside attack. 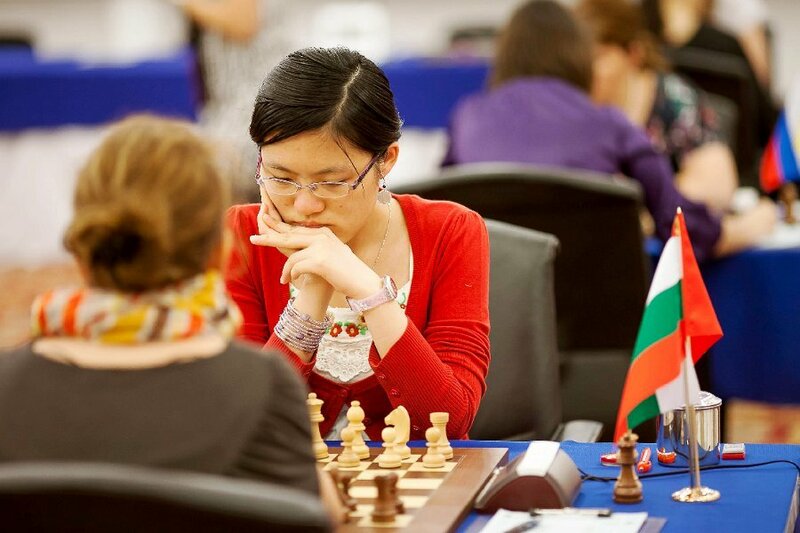 In the other games, women's world chess champion China's Hou Yifan obtained a better middlegame position against former women's world chess champion Bulgaria's Antoaneta Stefanova. Yifan then went on to implement a decisive attack and win. Another tense game, Koneru-Cmilte, finished in a draw. After six rounds of play, Elina Danielian leads with 4.5 points. Katerina Lahno and Anna Muzychuk share the second place with half a point behind. Hampy Koneru and Viktorija Cmilyte are sharing 4th – 5th places with 3.5 points, followed by Nadezhda Kosintseva and Hou Yifan who are placed 6-7 with 3 points each. Alexandra Kosteniuk, Tatiana Kosintseva and Antoaneta Stefanova are at 8 – 10 spots with 2.5 points. Alisa Galliamova is currently eleventh with 2 points, followed by Betul Yildiz with 1 point. The fifth day at the Kazan Chess Grand Prix for Women saw two decisive games right after the free day. Armenia's Elina Danielian held on to her lead with a draw against Viktorija Cmilyte. However, Anna Muzychuk defeated Betul Yildiz to join Elina Danielian in the lead. Katerina Lahno also beat Alexandra Kosteniuk to move up the table. Antoaneta Stefanova and Tatiana Kosintseva missed important wins against Alisa Galliamova and Humpy Koneru. Nadezhda Kosinsteva also drew with Hou Yifan. However, the field is still wide open and there are four players just half or a point behind. Anything could happen in the last few rounds at this exciting women's chess event. Don't forget to watch the sixth round live today India time at the official website: http://kazan2012.fide.com/. There is a live feed of both the chess games and the playing hall. Kazan, the capital of the Republic of Tatarstan, is hosting the FIDE Women's Grand Prix from From June 9 to 23, 2012. This event is part of the series of elite events organised by FIDE and Global Chess. There will be six chess grand prix events over two years in various countries around the world. The winner of each tournament wins 6,500 euros from a total prize fund of 40,000 euros. The overall winner also wins an extra 15,000 euros at the end of the series. The Kazan Chess Grand Prix Round 4 saw an upset for Women's World Chess Champion Hou Yifan as she lost to Viktorija Cmilyte. This is the second loss for the Chinese chess prodigy in the tournament. Meanwhile, Elina Danielian sacrificed an exchange with White and beat Tatiana Kosintseva. Humpy Koneru and Betul Yildiz were both struggling against time when Yildiz lost track and Koneru capitalised to win the point. Alisa Galliamova lost to Nadezhda Kosintseva. Two exciting games with fortunes swinging were played out for a draw by Anna Muzychuk - Katerina Lahno and Alexandra Kosteniuk – Antoaneta Stefanova.